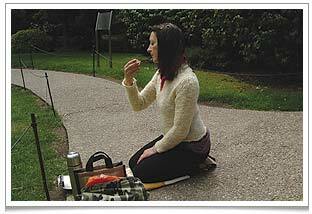 I’m serving tea to Britain’s Tea Poet, Elizabeth Darcy Jones. I was very privileged last Sunday to host the first open-air medteatation event, with nine of us gathered around the gorgeous lake in the Kyoto Garden in London’s Holland Park. With me there were Elizabeth Darcy Jones (Britain’s Tea Poet), May (@slowfoodkitchen), Luiz (@thelondonfoodie), Jane (@VirtuousBread), Judith (@theluxpod), Richelle (@Quintossential), Sam (@gansy09) and my old friend Irena Huk. All week long I had been watching the 5-day weather forecast with varying shades of anxiety, as predictions of a rainy Sunday came and went. Sunday morning itself started with an ominous, early downpour. But then the sky cleared. And then, as we arrived in Holland Park to prepare for the event, the wind rose again and dark clouds gathered, threatening another deluge. But thankfully the rain held off, and during most of the medteatation the sun was actually shining warmly, interrupted by only the tiniest ‘spit’ of rain halfway through. I like to think that the heavens received our message of kindness and compassion and returned us the favour! Meditating and contemplating the teas and my surroundings. In the picture are Sam, Richelle and in the far distance Luiz. We laid out nine positions, at roughly equal distances, round the lake, each numbered (the idea being that people would draw lots to pick their number). Then, as people arrived, they each laid out their teaware and teas, taking the time to admire each other’s tea settings, before the time came to begin the silent ritual process. From time to time, inquisitive wildlife sniffed around us, the ducks were curious and a squirrel nuzzled up to my leg. 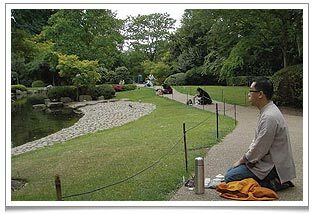 Equally, I enjoyed the human beings observing us, the sense of us and them happily co-existing: some perhaps puzzled tourists, the park cleaner doing his rounds, families with children, all the typical passers-by in a central London park on a sunny Sunday morning in early summer.. The setting could hardly have been more beautiful, but what I felt as a real blessing was the loving care shown by the people participating. This was manifest even in the way people had prepared and planned what to bring – the selection of cups, pots, trays and cushions which were strikingly different with each person yet all really lovely (see the pictures on chaya teahouse photo album.) – their orderliness, goodwill, punctuality and the calm, respectful way everyone engaged with each part of the process. Irena enjoying cups of tea brewed with kindness and compassion by herself and tea friends in the medTEAtation circle. For half an hour or so, we simply kneeled or sat in a pleasant silence, brewing a series of infusions of tea and sharing them with three neighbours in the circle to our left. At one point a stranger decided to join in, without a tea set! Others tweeted about the unusual sight they were witnessing. I guess the calm ‘vibe’ we were generating helped to welcome people in, as if our stillness had a power that radiated outwards! The tea I made, incidentally, was what I call The Emperor’s Golden Monkey, an ‘accidental blend’ I’ve come up with that combines Organic Golden Monkey and Organic Emperor Pu Erh 2008. The teas I got from other participants were Organic Snowbud, Lychee Black and Lishan Oolong, so I was very blessed to get a real, rich variety of tea types laid out in front of me with kindness and compassion, for my drinking pleasure! By the end of the silent time, everyone was very mellow and chilled. Several of us strolled back to teanamu chaya teahouse for a light snack of lo mai gai (vegetarian rice parcels in lotus leaf wrapping), a little more tea and some congenial chitchat. 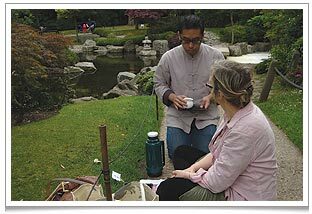 It had been unbelievably relaxing and calming sharing the teas, in the simple medteatation ritual, with tea friends (and the birds, ducks and squirrels!) Elizabeth called it ‘restorative’ and was kind enough to say it was ‘beautifully orchestrated’ and ‘a lovely introduction to medteatation‘. Luiz tweeted that it was an amazing experience and he felt well the whole day after. This first medteatation was, among other things, our way of marking, albeit belatedly, International Tea Day. The next medteatation, on June 19, will build on the experience of this first one: do join us! If you’d like to come, please register by emailing us or tweeting @teanamu or posting a message on teanamu facebook page. It was very peaceful and meditative. Would be loving to have you with us at the next medTEAtation!